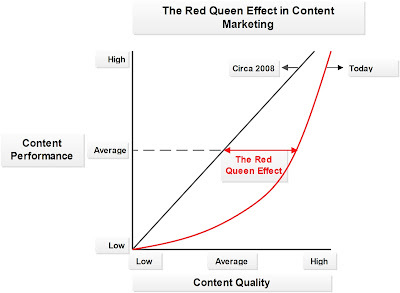 The impact of the Red Queen effect is particularly visible in content marketing. Over the past few years, the volume of marketing content has exploded, and this bounty of content has enabled consumers and business decision-makers to become more “choosy” about the content they consume. In a 2016 survey of 1,644 executives by The Economist Group, 75% of the respondents said they had become more selective in their consumption of thought leadership content over the previous 12-24 months, and 82% cited the volume of content as the main reason for their increased selectivity. In this diagram, the diagonal black line represents the relationship between content quality and content performance that existed when the spread of content marketing was still in its early stages. 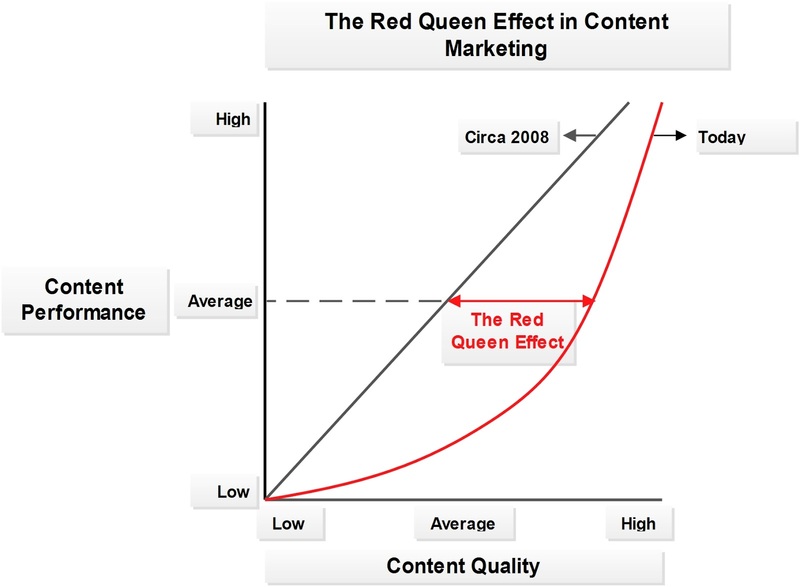 The red curved line represents the relationship between content quality and content performance today, and it shows that you need better content today to be successful at content marketing, another classic example of the Red Queen effect at work. Does this mean that companies should stop using content marketing? Not at all! It does mean, however, that most of the “easy victories” have already been won. 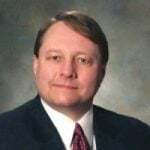 It also means that business and marketing leaders need to have realistic expectations about the benefits that effective content marketing will produce and the resources (time, effort, money, etc.) that will be required to make their content marketing program successful. There’s reason to believe that this more realistic view of content marketing is beginning to emerge. For the past several years, Gartner has plotted the evolution of content marketing in its “Hype Cycle for Digital Marketing and Advertising.” The 2014 edition of the hype cycle showed that content marketing was approaching the “peak of inflated expectations.” In the 2016 version, Gartner indicated that content marketing was nearing the “trough of disillusionment.” The 2017 hype cycle shows that content marketing is about to emerge on the “slope of enlightenment,” where both the benefits of content marketing and the requirements for success will be more widely understood.